Received January 21st, 2011; revised January 25th, 2011; accepted January 29th, 2011.
lem has been lack of “trust”. sity and experiences of users. norms’ or who are causing the problems” (Smart, 1984, pp. user groups such as older people in the UK. budgets and decentralisation (Powell, 2010). understanding of different levels of trust. tween expertise and laypersons (Giddens, 1991; Shapiro, 1987). The third key issue is on trust and organisational context. that interactions with users are transparent and trust facilitated. require the personal knowledge of any individual by another. 1998, 2005) which could alienate professionals and users. 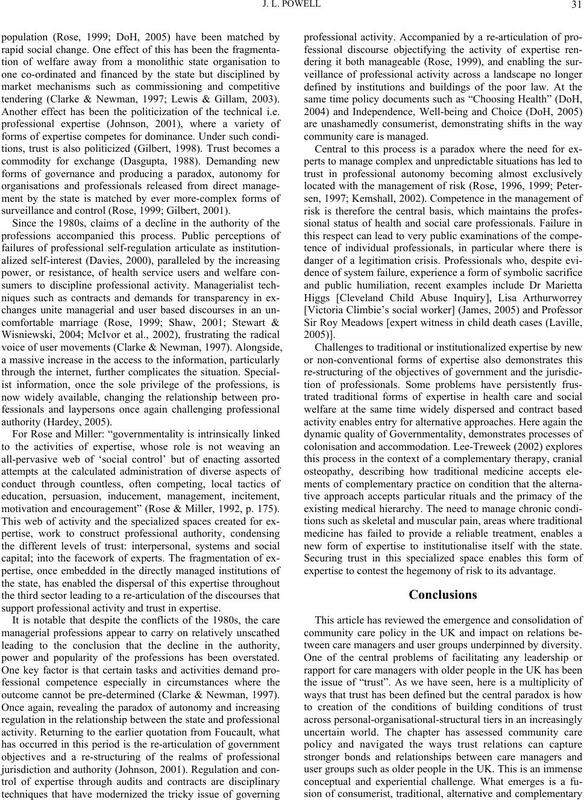 as: order, co-operation, reducing complexity and social capital. either confidence or reciprocity might support decision-making. to avoid confusing decisions with uncertainty. linked to the generation of emotional bonds and obligations. tality.” (Foucault, 1979, p. 21). trust an evermore valuable commodity. (Miller, 1993; Davidson, 1994; Rose, 1999). for state intervention through professional and lay activity. tendering (Clarke & Newman, 1997; Lewis & Gillam, 2003). Another effect has been the politicization of the technical i.e. 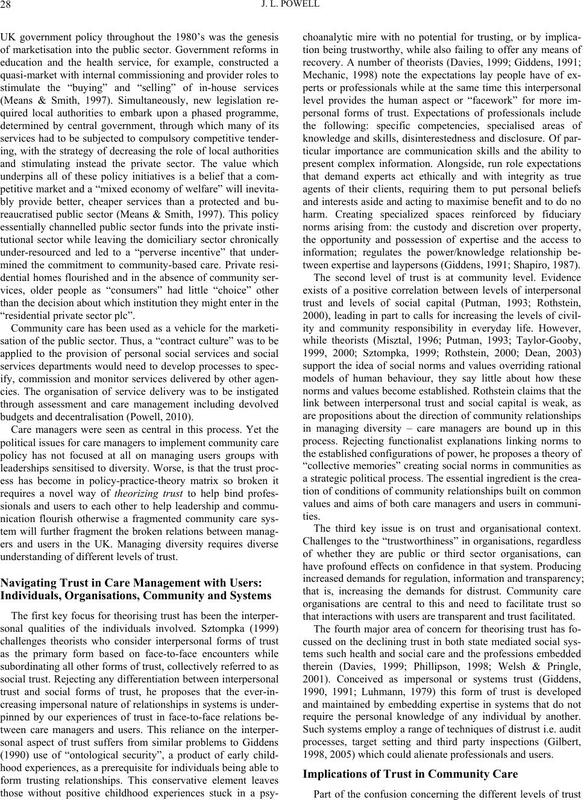 surveillance and control (Rose, 1999; Gilbert, 2001). motivation and encouragement” (Rose & Miller, 1992, p. 175). support professional activity and trust in expertise. power and popularity of the professions has been overstated. outcome cannot be pre-determined (Clarke & Newman, 1997). new form of expertise to institutionalise itself with the state. expertise to contest the hegemony of risk to its advantage. tween care managers and user groups underpinned by diversity. ing the contemporary authority of expertise are established. e.g. individual users, parents/carers and the local community. faction. Policy Studies Institute, (PSI). Bond, J. & Coleman, P. (1990). Ageing in society. London: Sage. Bone, M. (1996). Trends in dependency among older people in England. Bowl, R. (1986). Social work with old people. In C. Phillipson and A.
Walker (Eds. 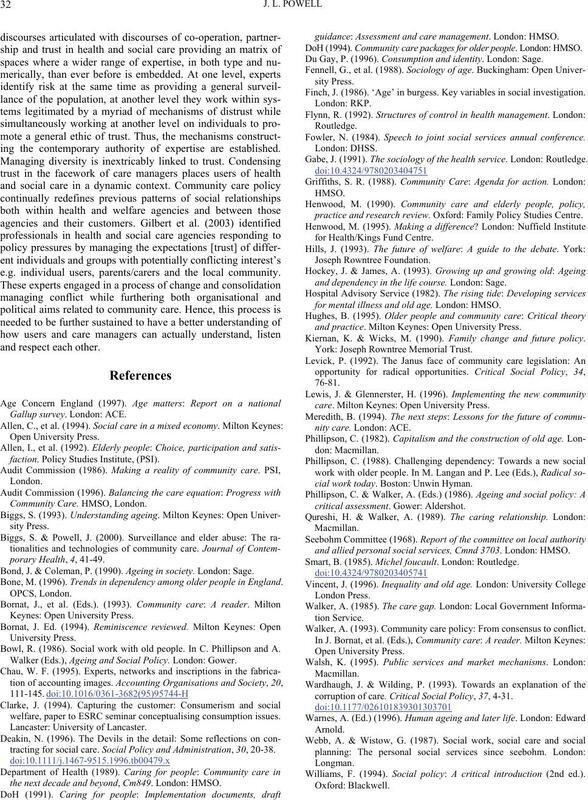 ), Ageing and Social Policy. London: Gower. welfare, paper to ESRC seminar conceptualising consumption issues. tracting for social care. 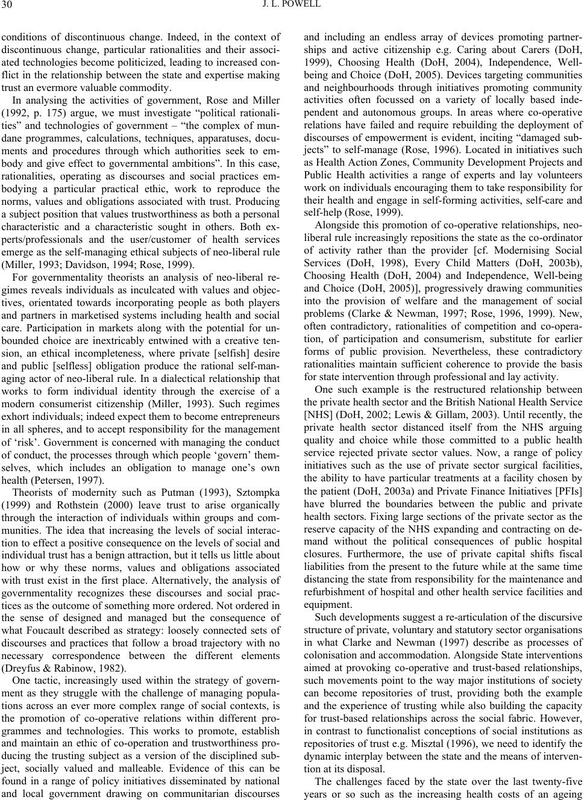 Social Policy and Administration, 30, 20-38.
the next decade and beyond, Cm849. London: HMSO. guidance: Assessment and care management. London: HMSO. DoH (1994). Community care packages for older people. London: HMSO. Du Gay, P. (1996). Consumption and identity. London: Sage. Finch, J. (1986). ‘Age’ in burgess. Key variables in social investigation. Fowler, N. (1984). Speech to joint social services annual conference. Gabe, J. (1991). The sociology of the health service. London: Routledge. practice and research review. Oxford: Family Policy Studies Centre. and dependency in the life course. London: Sage. for mental illness and old age. London: HMSO. and practice. Milton Keynes: Open University Press. Kiernan, K. & Wicks, M. (1990). Family change and future policy. York: Joseph Rowntree Memorial Trust. care. Milton Keynes: Open University Press. cial work today. Boston: Unwin Hyman. and allied personal social services, Cmnd 3703. London: HMSO. Smart, B. (1985). Michel foucault. London: Routledge. Walker, A. (1993). 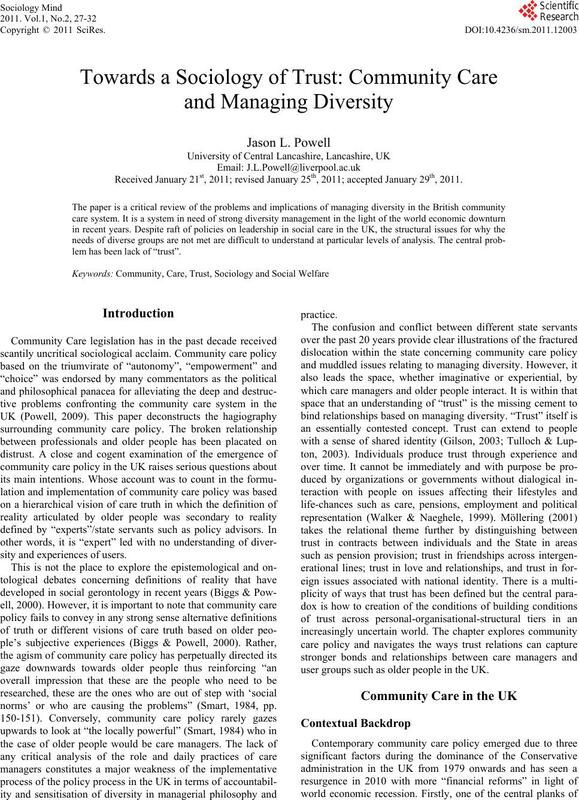 Community care policy: From consensus to conflict. corruption of care. 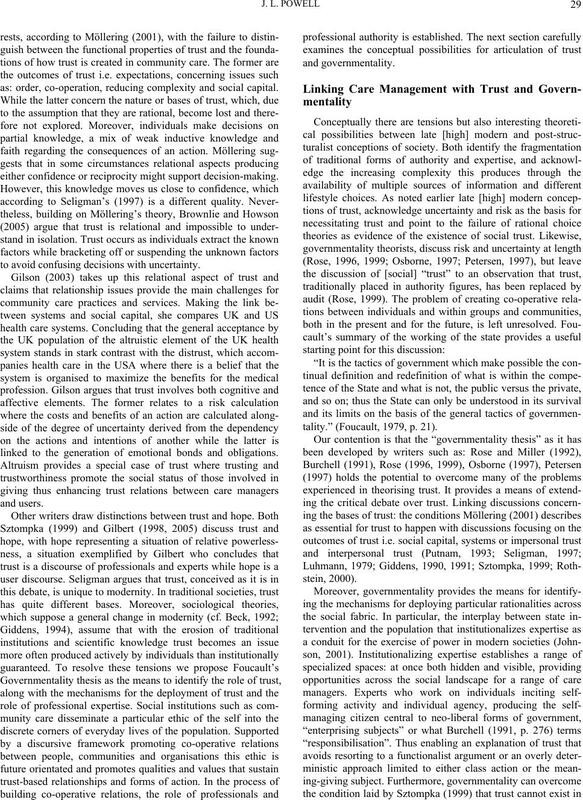 Critical Social Policy, 37, 4-31. Williams, F. (1994). Social policy: A critical introduction (2nd ed. ).